The recently discovered mystical sayings of Jesus, with facing-page commentary that brings the text to life for you. "The Gospel of Thomas really is, I believe, the clearest guide we have to the vision of the world's supreme mystical revolutionary, the teacher known as Jesus. To those who learn to unpack its sometimes cryptic sayings, the Gospel of Thomas offers a naked and dazzlingly subversive representation of Jesus' defining and most radical discovery: that the living Kingdom of God burns in us and surrounds us at all moments." This ancient text can become a companion for your own spiritual journey. In 1945, twelve ancient books were found inside a sealed jar at the base of an Egyptian cliff. One of those texts was the Gospel of Thomas, one of the most important religious archaeological discoveries of the twentieth century. While illuminating the origins of Christianity, it raises the question whether the New Testament's version of Jesus' teachings is entirely accurate and complete. Written at the same time as the canonical Gospels, the Gospel of Thomas portrays Jesus as a wisdom-loving sage. The aphoristic sayings emphasize the value of the present, teaching that the Kingdom of God is here and now, rather than a future promise or future threat. It presents a new way of looking at the challenging and intriguing figure of Jesus, and reminds us that the Divine can be found right here on earth. 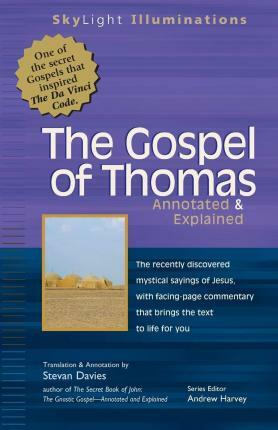 Now you can experience the Gospel of Thomas with understanding even if you have no previous knowledge of early Christian history or thought. This SkyLight Illuminations edition offers insightful yet unobtrusive commentary that explains references and philosophical terms, shares the inspiring interpretations of famous spiritual teachers, and gives you deeper understanding of Thomas's innovative message: that self-knowledge and contemplation of the nature of this world are the keys to the Kingdom of Heaven. "Professor Davies has taken the Gospel of Thomas to the next level of intelligibility and accessibility. The commentary stretches the mind, while the comprehensible and accessible translation make Jesus' (and Thomas's) voice clear. A masterful resource for both spiritual and intellectual seekers!"